The Android operating system is known for its flexibility of applications. It can be used for smartphones, tablets, and digital TVs. What the programmers in Google probably didn’t foresee is someone using it to run a cocktail-mixing robot bartender named iZac. Nick Johnson, the inventor, used a Motorola Xoom and put together his own custom Android app for the user interface. 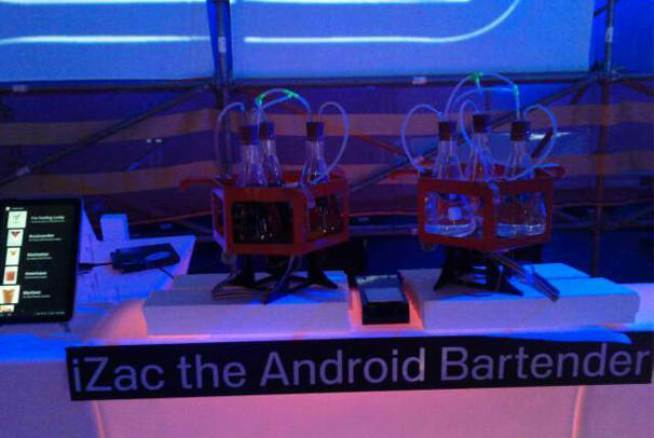 The actual ‘barbot’ are two rotating platforms that contain beakers of liquid ingredients. A system composed of an aquarium pump, pinch valves, and tubes is used to dispense the mixers. The machine knows the exact amounts and proportions through a digital weighing scale. You select and order a drink on the Xoom’s touchscreen. Then you’re instructed to place a glass on the scale between the platforms. The robot then goes into action and starts pouring and mixing the drink. For a bit of fun, you can press the ‘I’m feeling lucky’ option which will randomly mix 3 ingredients. It’s okay to complain loudly if you don’t like the outcome. This bartender isn’t programmed yet to kick you out of the bar.